Understated patterns and textures are often exactly what a room needs to feel complete. The Vita Rug Collection by Nourison celebrates understated design and shows exactly how beautiful patterns can be when they’re used as an accent or additional texture in your space, rather than taking over and becoming the feature piece. Cosmopolitan and modern in style, the Vita Collection has a charming simplicity to it as well as a cool, calm and collected feel which makes it very popular. Versatility is key to the Vita Collection as the simple colourways and use of neutral colour palettes ensures the rugs can be enjoyed in all styles of home and space. The textures, effects and styles used in the rug range allow it to be interesting and captivating without overwhelming any room’s colour scheme. 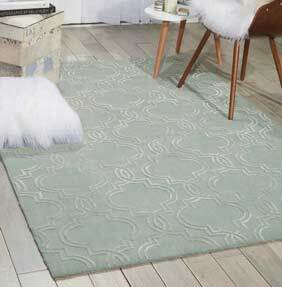 The majority of rugs in the Vita range have a two-tone colourway and this shows off the simplicity of their patterns and styles. The rugs gentle colourways at matched perfectly with their patterns which have an almost three-dimensional feel to them. Nourison are a high end luxury designer of rugs and other floor coverings. They have become well-known for the high quality and wide range of designs they offer. Elegance is instantly added to any space which is home to a Nourison rug and this is especially true of homes where you find examples from the Vita rug collection.